This beautiful, newly renovated, 8 story Doubletree Hotel is located in the heart of the Red Mesa valley overlooking the lush valley and the famous bluffs of the Grand Mesa Plateau. 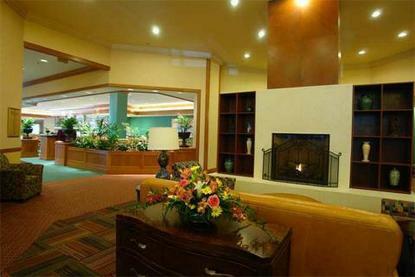 Our 273 room hotel offers all the necessities for family vacations and business trips. All rooms provide upgraded bedding/bath, spacious work desk with speaker phone, voice mail, complimentary high-speed wireless Internet, refrigerator, microwave and coffee maker. Our extensive landscaping includes a children's playground, tennis courts, basketball court, horseshoe pits, volleyball court, pool, and whirlpool. The amenities of the hotel provide Jacuzzi suites, restaurant, lounge, room service, complimentary Business Center, gift shop, fully equipped Fitness Center, guest laundry, transportation within 5 miles and bus parking. Conveniently located off I-70, near the airport, government offices, St. Mary's Hospital, Mesa State College, Community Hospital, and the Theatre district. Just minutes away, you can find attractions including the Historic Main Street Shopping Mall with 150 shops, museums, restaurants, City/Federal and Justice Offices, Business District, Redlands Mesa Golf Course, Amtrak Depot, Two Rivers Convention Center, Palisade Wine Country Tours and Tasting (12 wineries), Colorado National Monument and the Grand Mesa where you can enjoy hiking, biking, rafting, fishing, skiing, snow-boarding and many other outdoor activities. Our facilities provide 12,700 sq. ft. of convention space with up to 14 breakout rooms, including a Grand Ballroom of 5,000 sq. ft. Beautifully landscaped gardens provide ample space for banquets and weddings during the warmer months of the year.